Former Maldivian President Mohamed Nasheed’s trial will resume on April 4. The stage is set for what is expected to be the latest drama amid the ongoing political turmoil in the Maldives. A local court will resume the trial of former President Mohamed Nasheed on April 4 after granting him a four-week reprieve earlier this month. 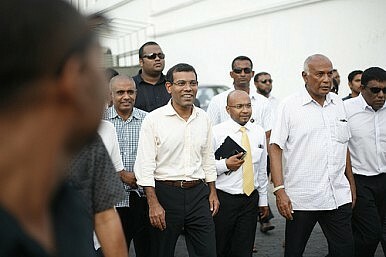 Nasheed is accused of illegally detaining the chief judge of the country’s criminal court for releasing a politician charged for anti-government activities during his presidency – which became the cause of his ouster in February 2012, after soldiers and police mutinied and stormed the headquarters of Nasheed’s Maldivian Democratic Party (MDP). Multiparty presidential elections were held in the Maldives for the first time in 2008, ending nearly 30 years of one-party rule. Nasheed, who won the polls and became the country’s first ever democratically elected president termed his ouster a “coup,” while his successor, Mohamed Waheed Hassan, who had been serving as his vice-president, claims Nasheed resigned of his own accord in response to opposition-led protests. In February 2013, after a year of political turmoil, Nasheed sought refuge in the Indian High Commission for close to two weeks after a court ordered his arrest for failing to appear to face charges of abuse of power. After reports of a deal brokered by India, Nasheed left the Indian mission on February 23, only to be arrested and brought to court to face trial a fortnight later on March 6, prompting concerns over his personal safety. Amid growing doubts about the real motivation for the trial, the question that emerges is whether the international community would countenance and recognize the result of the upcoming polls if Nasheed is convicted and barred from contesting. Last year’s contentious transfer of power was almost immediately recognized by India and the United States. The West also endorsed the findings of a Commonwealth-backed Maldives Commission of National Inquiry set up by the Maldivian government in August 2012, which cleared Waheed of any wrongdoing during the transfer of power. The strategic calculus behind last year’s questionable endorsement of the circumstances surrounding the political transition rests on two factors. First, India and the United States share concern about the growing Chinese influence in the tiny nation. In 2011, China announced it would set up an embassy in Male amid growing military and economic ties between Male and Beijing. Accepting the political transition was partly meant to check China’s sway over the Maldives. Second, India and Western democracies are worried about the growing influence of Salafist parties such as the Adhaalath Party in the Maldives, coinciding with the rising radicalization of the island nation. This was evident when a bomb detonated in Male and wounded 12 Western tourists in September 2007, followed by a suicide attack in May 2009 on the headquarters of Pakistan's Inter-Services Intelligence (ISI) in Lahore by Ali Jaleel, a Maldivian member of Al-Qaeda. Close on the heels of that attack, Pakistani troops arrested nine Al-Qaeda operatives at a training camp in South Waziristan in 2010, who turned out to be Maldivian citizens. However, it is highly unlikely that either India or key Western democracies would be as accommodative of the Waheed government if Nasheed is barred from contesting the September elections. India in particular has toughened its approach towards the Maldivian government since the latter cancelled a U.S. $500 million contract awarded to a consortium led by Indian firm GMR to modernize and operate Male’s international airport. In December 2012, India also tightened visa rules for Maldivian nationals, warning that Maldivians travelling to India for purposes other than tourism on a tourist visa could face deportation. The most significant indication of India’s changed stance was its decision to grant Nasheed refuge at its mission in Male. This represented a significant departure from last year, when Indian Prime Minister Manmohan Singh welcomed Waheed soon after the transition. The growing anti-Indian sentiments expressed by Islamist parties such as the Adhaalath Party, allied to Waheed’s Gaumee Ithihaad Party (GIP), have also contributed to India’s more hardline approach. Meanwhile, the U.S. and EU also seem to consider Nasheed’s participation imperative to free and fair elections. The EU indicated as much when it stated on March 14 that it would find it difficult to consider the upcoming elections credible and inclusive without Nasheed’s participation. By taking a firmer stand on the political turmoil in the country, India and other key stakeholders seem to be signaling a new approach in their engagement with the Maldives, which could help to ensure free and credible elections in the archipelago.